Rating: Last year’s debut album from Son Of Sam, Cinder Hill, ended up being MB’s album of the year and deservedly so pairing, as it did, dope all-original (and mostly live-played) beats with an array of legendary emcees. One of the absolute highlights of this LP of highlights though was self-affirmation anthem, Fighting Talk, featuring bars from Blaise B and underpinned by a dubby-bassline and a heavy dose of 90s-style soul from Lifford Shillingford’s hook which lent it an early Wu feel. 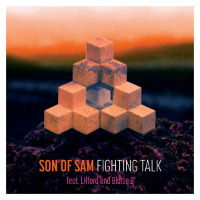 The track is now released on the Fighting Talk EP, which features the original along with live, dub and shuffling jazz versions plus the ‘pella, the instro, a clean edit and the instro of another album track Phenomenal Don. Blimey. Now’s also your chance to check out the video filmed when band and vocalists performed live on Radio 4’s ‘Loose Ends’ programme. Radio 4?!!! Not Radio 6 or Radio 2 or even Radio 1? BBC Radio 4? Yep, that Radio 4; that ‘Loose Ends’. Presented by Clive Anderson!